Select the link multiple and the pop up window will say open and you can search and link a each of inspections, entering the details as you go, without the window closing. Inspections, Modifications, ADs & SBs Templates can now have multiple documents uploaded into the template record. Simply select +, enter a title, select the file to upload and select upload. When completing inspections it is now possible to enter the correct data when the actual inspection was carried out. If there is a current Tech Log open for the aircraft users can look up aircraft values at a certain date and the aircraft values will backdate. If inspections or components have extensions simply click the + icon in the "Remaining" column and enter the applicable data. Sort the Aircraft Module tabs efficiently with the new multiple line sort feature. Simply lick "Sortable", tick the records that need to be moved and click the grey arrow. This will move all the records selected directly under the grey arrow line. When tabs are in sortable mode it is no longer possible to update the data on the tabs until the "Locked" option has been selected. If the Aircraft Module "Save to Template" option is used to update the Aircraft Config Module this is now reflected in the History located on the Aircraft Config General Tab. 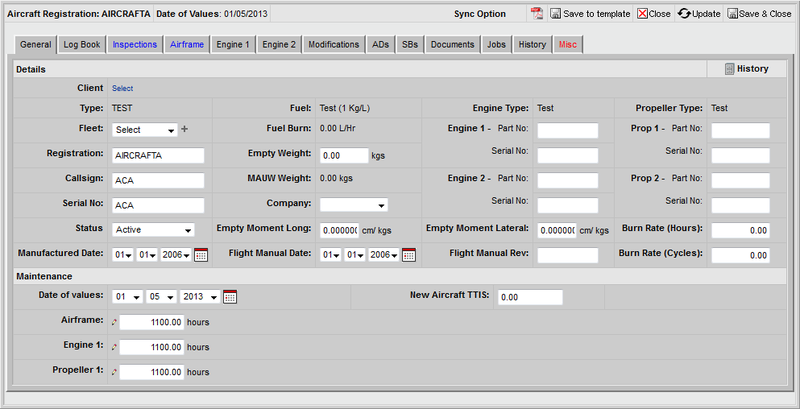 Customize aircraft/tech log mapping directly in the Aircraft Config Module. Only see the fields/rows specific to that aircraft model/type. Rename unused fields or change the sort order. Once complete all screens displaying aircraft values will only display with this format. Store any offset data directly on the Aircraft General Tab.